In an unlikely partnership, automotive giant Ford has teamed up with a hospital that specializes in cancer care. The benefits of this partnership have led to improvements in patient care, and are helping with the Ford move towards an autonomous future for its vehicles. 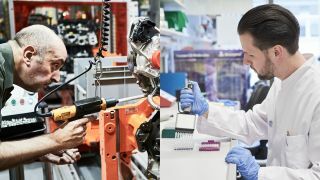 After being admitted to hospital with colon cancer, Ford’s quality director at its assembly plant in Cologne, Mike Butler, realised that there were processes from its factories that could improve the running of the hospital. On the other hand, the hospital had computer processes capable of dealing with vast quantities of data, specifically being used to map the human genome. This same computational force will be necessary for self-driving cars to be able to deal with the vast amounts of data produced on the road. While the improvements to aid self-driving cars is yet to make a real-world difference, the improvements in the hospital are already having a dramatic effect. After implementing colored lines leading around the hospital, screens to show stages of a process, and the adaptation of rooms to move from smaller, fixed rooms to larger, flexible rooms with movable dividers, the hospital noted a 30% improvement in patient flow. This obviously means that more patients can be seen, potentially aiding more patients going into remission. And you’ll be glad to hear that Mike Butler has indeed gone into remission, although whether that has anything to do with the new processes is unclear. What is interesting is seeing how seemingly completely unrelated industries can lead to potentially life-changing improvements in both fields.